Today I said to hell with housework,gardening and cooking. I haven't really sat down at my sewing machine in a while. So today I finished the top of this quilt, I have been working on for a while. Hubby always asks when one is finished too this point. Who's this one for? No one! I just wanted to see what this pattern looked like when made up. Your colors are always so tasteful and calm! Very serene! I always think to myself - now I could really sleep peacefully under that one! I am very careful when picking out my colours. They have to be right.. Such pretty colours and design -- light and frothy. 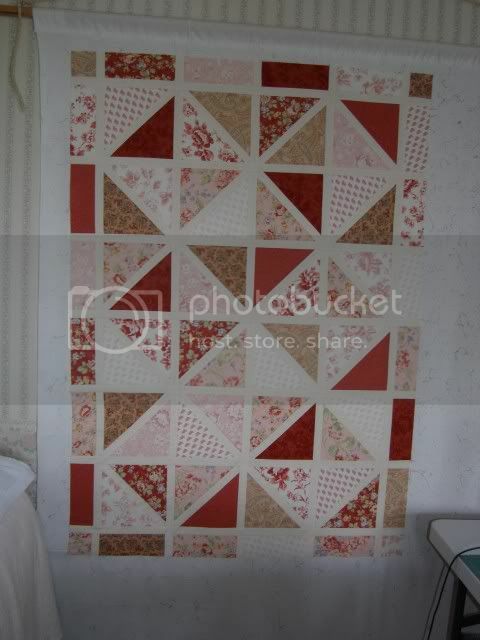 It really looks and 'feels' like a summer quilt! Thank you. Sending all my good wishes to you. Wow, that's really nice with those fabrics - I like the way the pink-and-white cross-hatched one almost looks like it has bumpy texture.